While we haven't even reached the end of the year, we are actually a week past the Winter Solstice which was on December 21st. The Winter Solstice is when the North Pole is tilted the farthest from the sun and there is the least amount of daylight. In Chicago we are currently gaining about 30 seconds a day of daylight and by the end of January will be gaining two minutes a day. But there are still a lot of long, dark nights ahead. A red reflector visible from 100 to 600 feet by a car with its headlights on. 625 ILCS 5/11‑1507) (from Ch. 95 1/2, par. 11‑1507) - Lamps and other equipment on bicycles. (a) Every bicycle when in use at nighttime shall be equipped with a lamp on the front which shall emit a white light visible from a distance of at least 500 feet to the front and with a red reflector on the rear of a type approved by the Department which shall be visible from all distances from 100 feet to 600 feet to the rear when directly in front of lawful lower beams of headlamps on a motor vehicle. A lamp emitting a red light visible from a distance of 500 feet to the rear may be used in addition to the red reflector. Curiously, this Section also provides that a red light visible from 500 feet may be used in conjunction with the rear red reflector. This is somewhat awkward because it would make sense to allow a red light visible from 500 feet instead of a red reflector that may only be visible from as little as 100 feet. I'll give the drafters of this law the benefit of the doubt and conclude that this addition was to encourage bicyclists to use red lights on their bikes. In any event, the law (as well as sound safety measures) require the use of a headlight and a reflector and at least encourages the use of a rear red light. With these long winter nights ahead, the use of a headlight and a taillight will get you home safely - and legally. Keating Law Offices represents victims of bicycle accidents in courts throughout Illinois. The firm also represents clients in Illinois in personal injury and wrongful death claims with insurance companies prior to litigation. 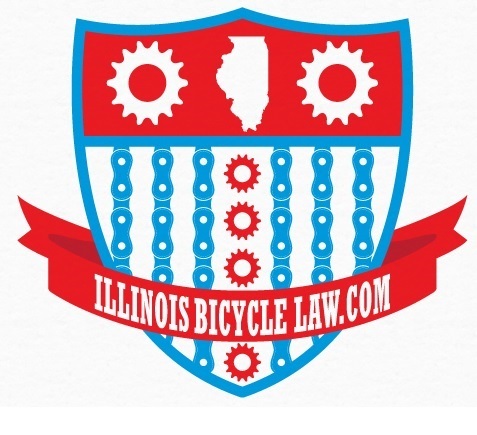 The firm is a national leader in the field of bicycle law. 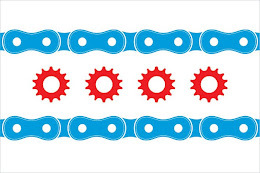 If you have any questions regarding this post or an issue involving Illinois personal injury law, contact Illinois Bicycle Attorney Mike Keating at 312-208-7702 or MKeating@KeatingLegal.com 24 hours a day, 7 days a week. All e-mails and phone calls are returned promptly. All initial consultations are confidential and free.